The dollar became the focus of a lot of speculation last week when it reached multi-year highs against a weakened euro. The return of "King Dollar" worries many analysts because it means that foreigners can afford to buy fewer U.S. goods, depressing demand for many U.S. firms and cutting into profits. On the other hand, a stronger dollar makes imports cheaper and increases the buying power of U.S. consumers, which has been historically good for the economy. Speaking of history, Monday, March 9, 2015 marked the sixth anniversary of the current bull market, which began on March 9, 2009. Though markets have been turbulent in recent weeks, let's take a moment to think about how far we've come since the dark days of the financial crisis. 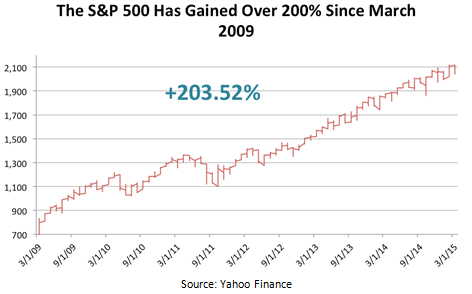 Since the bottom of the stock market, the S&P 500 has gained 203.52%, surpassing previous market highs along the way. Bottom line: Economic fundamentals have come a long way and there are plenty of factors that support continued equity growth. That's not to say that there aren't headwinds that may affect market performance in the future. The Federal debt debate is rearing its ugly head again in Washington as lawmakers square off about the Treasury debt ceiling, which will be breached this week. We're also approaching the end of the first quarter and investors will be looking toward corporate earnings releases to see how U.S. companies performed. Markets may remain choppy as investors take stock of current fundamentals and try to predict how policy changes may affect markets. This week, analysts will be closely watching the Federal Reserve's two-day policy meeting, which is one of the most important we've had since last year. Though we don't expect the central bank to raise rates this week, investors should know a lot more about the Fed's plans once the meeting is over. Retail sales fall in February. U.S. retail sales dropped for a third straight month, surprising many analysts who counted on job growth and cheap gasoline to boost sales. Harsh winter weather may be keeping shoppers at home, depressing retail spending numbers. Weekly jobless claims drop more than expected. The number of Americans claiming new unemployment benefits fell last week, erasing much of the previous weeks' increases. Economists suspect seasonal factors are at play and that the labor market continues to improve. Consumer sentiment slides for fourth straight month. American consumers ratcheted back their optimism about the U.S. economy in early March, though temporary factors may be affecting data. While affluent Americans remain confident about the future, lower and middle-income consumers are worried about their prospects. Weekly mortgage applications drop. A sharp increase in mortgage rates last week caused a corresponding drop in mortgage applications. Both mortgage applications and refinancing activity fell as buyers responded to higher rates.